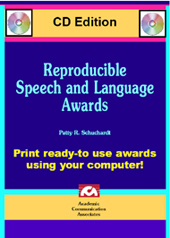 This digital file includes over 100 reproducible speech and language awards. Illustrated awards with cute illustrations are included for young children and awards with text only are included for older students. This product includes award certificates for articulation, language, voice, and fluency that you can use on a daily basis to reinforce good speech, successful completion of assignments, good behavior during speech sessions, and more. The digital file features all of the awards from the Handbook of Reproducible Speech and Language Awards plus new certificates. World's Best Sounding Voice . . .AND MANY, MANY MORE. The digital file format makes it easy to print out awards from your computer as you need them. Just select the award that you want to print from the contents list and print it out. This CD product includes a PDF file (less than four megabytes) that may be downloaded. If you are unable to open the sample pages in this ad, you need to obtain Adobe Reader before using the file. Adobe Reader is available FREE at www.adobe.com. A downloadable version of this product is available at a lower price. If you would prefer to download this product, click here.